The pictures of Muammar Qaddafi’s death have made me reflect, as they must have made many people reflect, on the equally gruesome images of Saddam’s death. Did Qaddafi himself think about Saddam, in those last minutes of his life? My question is speculative, but I do not think it is unreasonable. This may have seemed odd, on Saddam’s part, to the many people who keep insisting that extremist ideologies in the Arab world of our own time bear no relation to the fascism of Europe a few generations ago. But the invocation of Mussolini came naturally to Saddam, I would imagine. The invocation was, in any case, prophetic. In 1945, after Mussolini was executed by Italian partisans, his body was cruelly and grotesquely displayed to the public in Milan, upside down on a meathook, where people could throw stones at the corpse. Saddam, upon his own execution, was turned into a similarly barbarous spectacle, by means of the cell-phone cameras of certain Iraqi witnesses—a defeated tyrant, lifeless and demeaned in front of the world. Tyrants are a brotherhood of anti-brotherhood. They do seem to identify with one another. And the tyrants feel their sinister brotherhood no more keenly than at the moment of their own deaths, when each new executed tyrant reflects upon the death of his predecessors. We know this from the execution of Louis XVI, in 1793. “I will suffer the fate of Charles I,” Louis XVI wrote to his lawyer, referring to the execution of Charles I in England in 1649 (if I may rely on the account given by Chateaubriand). And of whom did Charles Stuart think, as he himself was led to the gallows? Did Charles I reflect on the trial and execution of King Agis of Sparta in 241 B.C.E.—his only obvious precedent? We do not know. Nor do we know where Qaddafi’s own thoughts led, in his last weeks and minutes. Perhaps someone will tell us. The idea that Qaddafi might have reflected on Saddam seems to me plausible, if only because we know that, after the invasion of Iraq, Qaddafi offered to abandon his own nuclear program—a fact suggesting that Qaddafi was following the Iraqi events closely. Probably the question will never be answered. If only Qaddafi had been brought to trial, we might have learned. He would have enjoyed, as Saddam enjoyed, a last opportunity to wave his fist and to invoke his heroes and role models. The photographs and videos are horrific. We might take the occasion to recall that tyranny, too, is horrific. And we might soberly reflect that America has been associated, one way or another, with every one of these regicides—apart from that of King Agis of Sparta. America was born, on its Pilgrim Fathers’ side, of the Puritans who brought down Charles I. The overthrow of Louis XVI was directly influenced by the American Revolution of 1776. Saddam was executed as a result of the American-led invasion of 2003. 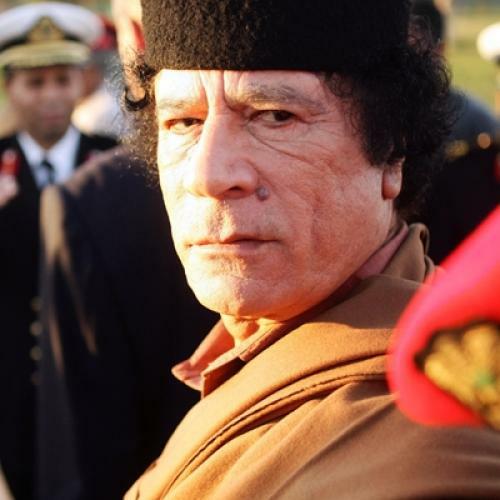 Qaddafi fell victim to a Libyan revolution that triumphed only because of support from NATO and the United States. America’s role in regicidal events is not a reason to gloat. Even the death of a tyrant is a sorrowful occurrence. To shudder at anyone’s untimely death is a humane instinct. Let us shudder. But we have no reason to feel ashamed.